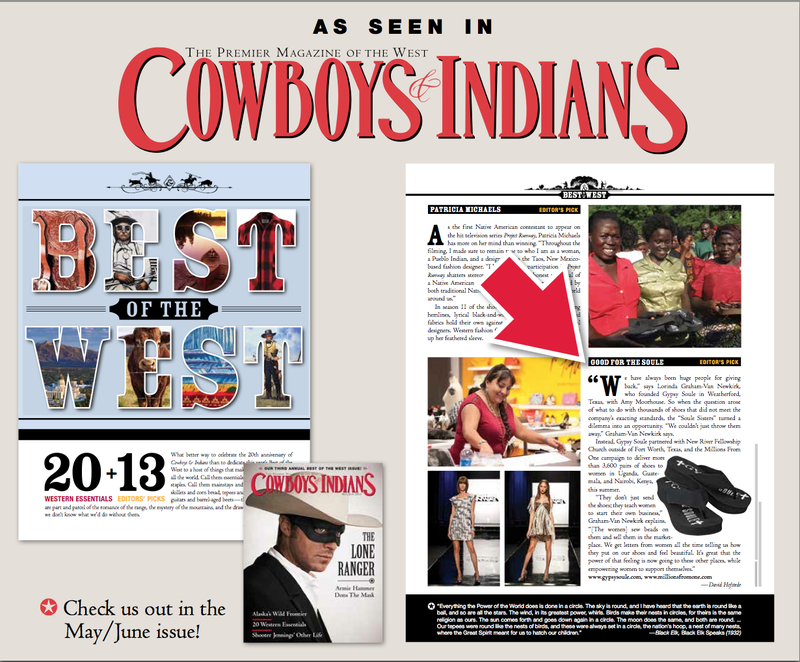 Gypsy Soule has been featured in an article in the May/June 2013 issue of Cowboys & Indians. The Giving Gypsies contacted New River Fellowship of Weatherford in hopes to find a way to give shoes to people in need. From there, they were put through to Bill and Danielle Ford who founded the charity, Millions From One, that recognizes the need for drinkable water in Third World countries. This summer, women from these countries will receive more than 3,600 pairs of shoes from that were donated by Gypsy Soule. Make sure and get your copy today! This entry was posted in Giving Gypsy by admin. Bookmark the permalink.